These zany pieces remind me of Alice in Wonderland!–the Mad Hatter! I have no words to describe such an ugly collection. I was looking for comments in Google but couldn’t find any. I guess people might be processing this show of bad taste. Does this mean that hats are making a comeback? I hop so! Wow! Magnificent hats & boucle coats… Love the cream boucle coat! These are wonderful and fun outfits! Perfect for the Mad Hatter’s Tea Party! I love the Louis XVI shoes!!!!!! Don’t like the Japanese youth hats. Like the tulip shaped skirts on those dresses. All together not so sure. I guess I like. The hats are just so distracting. They make it hard to figure out what the outfit really looks like without them. Anyone else love the tights/sock. shoes with big buckles? I sure do. looks like marc jacobs watched the pick up artist on repeat! its the hat that kills me. and i’m a devoted fan of marc jacobs. I’m looking at some sort of 90′s throwback, which I’m not sure what to feel about. It seems kind of random. The shoes are faux witchy and cool, however. u g l y…. Yikes!!!!! Seriously, that is some awful ’90′s, cat-in-the-hat raver bulls**t.
Ridiculous! I’m so mad that I wasted a minute of my life even looking thru this collection of photos…is this a joke? Beautiful! I love the shoes! What happened to Marc Jabocs??? I was waiting for this, awesome! Difinetely, I’m not liking this collection! I am blown away. I just love it! helena bonham carter must be so happy and inspired. Fashion is, as a matter of necessity, about curiosity and the desire for more. If we didn’t have people like marc jacobs who were brave enough to throw out new ideas without worrying about if they are conventionally ugly women would all literally still be wearing corsets. Not a big fan of the collection, some coats are lovely but altogether it is just a mess. great play with proportions and loose geometry! This collection is hideous beyond belief. An unflattering cacophony of colours and shapes. It looks like a student’s end-of-year show. Strong Yohji and Comme vibes, yes, but far less creative and inventive. Inexcusable use of fur. Disappointing and silly. These caps are really astonishing. Wonder how it looks in real! NICe blue background colour for fashion outfits and pics. I love little hat like models you show. Love this runway :) Shoes remind me to puss in boots! wow love the third look! The hats are a little Pam Anderson circa ’99…. There’s no point in the oversized clothing, if he’s playing with scale á la Alice and the mad hatter etc. (in itself a rather unoriginal inspiration) then it’s not working. Looks like the hats were inspired by Jamaroquoi from the 90s! Wow the hats are crazy! That is sooo ridiculous, complete desperation. Talk about ‘the kings new clothes’. Welcome to Alice in Wonderland! Unexpected.. Sorry – I know it’s runway, but those hats are ridiculous. it reminds me of Tim Burton’s work…very cool! The only thing I love is the print on the dress in the second photo. The rest is just too bulky for my taste. Those hats and jackets – eek! NASTY except for the shoes ! I would not consider this a “new idea”…. I too, feel there is nothing even artistic about these cloths and the combinations. Perhaps, putting the collection together like this makes it just seem like a “JOKE”! I wonder if he was inspired by My Fair Lady… Love the hat!!! Nice lights for the models and outfits (from different sides) and nice colors! But soon i will be in Milan fashion week to talking about the catwalks set-up.
. . . this collection with its nod to 80′s / 90′s Rei and Yohji interpretations of western dress is SO of the momnet most people do’t realise it yet . . . Glorious textures and fabrication . . .
at this point, i think he just tries to see what he can get away with & call it fashion–and everyone buys into it, regardless of what it looks like. I really wish I could have been there to see the show… the collection seems funny and sad, beautiful and ugly, all at the same time. Very inspiring to me! Once again Jacobs shows his genius. Looks like an amazing show!! What fun! I can imagine that the large scarf anchored with a bit kilt pin (?) will be much copied in the year ahead! Love it! 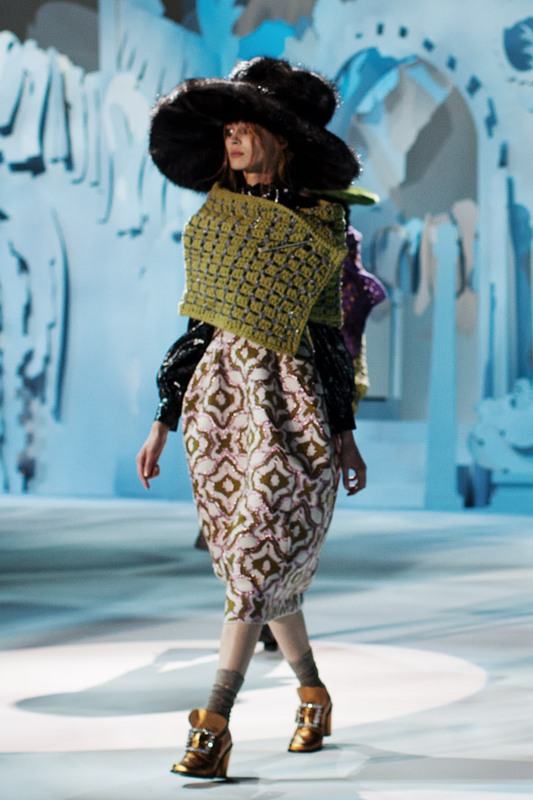 I´m not crazy about the hats, but I think this collection is a beautiful and complex piece of work. I see great, wearable pieces and great fabrics and textures. Love the shoes and socks!! Beautiful collection! I liked this, for a number of reasons. One, the silhouette. I love that tulip shape, wore it in the 90′s and it was very flattering. Two, I love the hats, period. If you’re going to wear them, wear them. Three, his coats are to die for. And finally, where can I get those shoes? Pure, unbridled hate for those shoes. Fabulous! Wonderful shapes. I am delighted! The coats and shoes are lovely, the hats a wild, untrammelled delight. I take it they fold away neatly into handbags, motor car side-pockets and come with personal liability insurance in case you bump into someone and knock them cold. Over here, we think it may be a parody on Street Style in general. 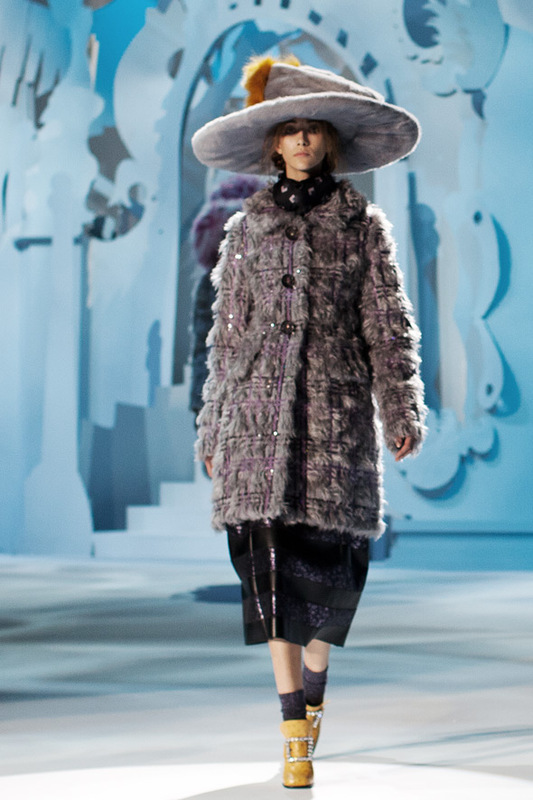 Marc Jacobs said back stage that he took inspiration from the likes of Anna Piaggi and Lynn Yeager. Plus the crumbling castle back drop? Is he trying to tell us something? Could it be a fall in taste on the street? We just posted an article about it. Miss Patty Pace hits the runway! (Bonus points if you get the 19th-cent lit ref.) I actually mostly like this. 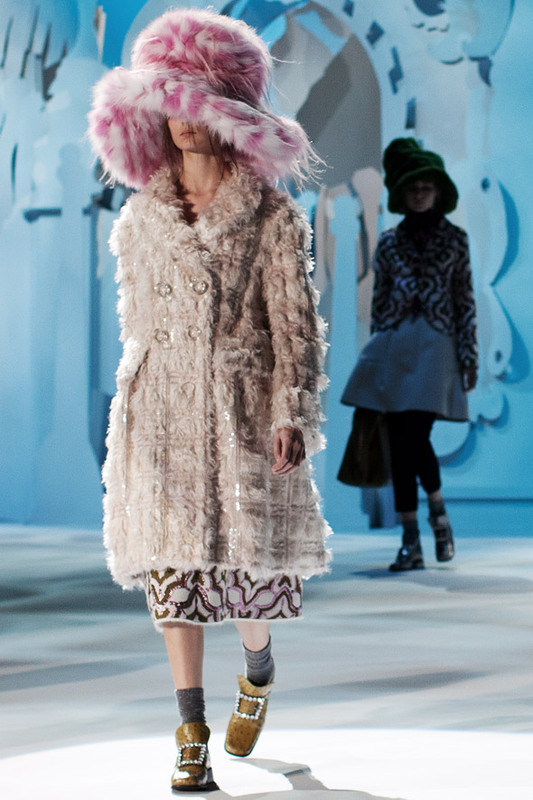 The ensembles as shown are OTT, esp the unfortunate Pamela Anderson hats, but I can see the best elements of this collection–gorgeous fabrics, longer structured skirts, funked-up “lady” coats, 19th-c & Edwardian references–translating well into “everyday” clothes. And those shoes… as the young ‘uns would say, squeeee! Rebel, Rebel! Twisted! Trippy! Marc Jacobs is a mad genius! The fifth one down is just off-the- freakin’ hook! it’s one thing to gain inspiration from a cultural moment. it’s another thing all together to produce work that looks like that of a living and working contemporary designer (Vivienne Westwood for at least one). even worse to select materials that make the collection look like a fashion school freshman endeavor. Thanks. A fairy tale?….A dream come true? Who would wear this? Fashion editors only? It’s horrible. this show is inspired by the worst of burningman.
. . . reflecting further, what I really LOVE about this collection is how UNDEMOCRATIC it is . . . so little to appeal to the knock-off merchants . . . Marc is a genius . . .
@une chatte grise, The Lamplighter. (Googled, alas–no bonus pts.) I appreciate the book recommendation. Liked the collection, but it is true that the hats are so distracting! super…crazy. Love the color sensibility. Oh my! Quite shocking…in a bad way! The shoes are okay, but only just. Really unflattering silhouettes. The only redeeming factor is the black and white floral print and cut of the dress in the 4th image. Otherwise it’s like watching Eliza Doolittle on acid. I think so many of the negative comments are just wrong. If you look closely, there are so many beautiful pieces, dresses that stand on thier own without the hats, etc. that are used for the runway! Wonderful collection, I adore all the crazy hats. Can you say “burning man”. The clothes are fantastical. I think they are very helena bonham carter and it’s quite individual. I noticed the make up on the models the most, which makes me suspect the clothes are unimpressive…..
Not all bad, I mean the socks in the second pic are ok.
And the Marc Jacbos has done it again. bringing the pimp hats, pimp jackets, and pilgrim shoes back… where’s the cane? the pimp pilgrim- i like how that sounds… in all serious it is however exciting and entertaining and full of textures and layers which are absolutely delicious. Wow, beautiful collection! But while the juxtaposition of the tailored, feminine clothing with the masculine shoes is interesting, the shoes are quite unattractive overall. It’s truly inventive in shapes. It’s a couture construction , with large and easy proportions. And also a bit Christian Lacroix nineties inspiration mixed with Victorian period. 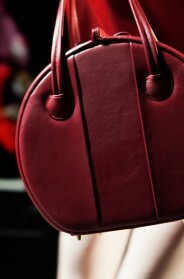 Today, with Miucci Prada and Ghesquière, Marc Jacobs is once again the best. He gives us new ways to wear and makes us dream. I agree with une chatte grise; [and the gold shoes are ace]. The clothes are like dolls dress ups in their scale and materials, ie: the scarves. People calling this derivative or a rip off – would you say the same if it was to your taste? I never read comments like that about more conventional clothes. They look like crazy cat ladies! I can appreciate the whimsy and art of the coats and hats, but what strikes me is how some of the most lovely and flattering silhouettes I’ve seen in quite a while are buried under too many statement pieces-per-ensemble. The dresses are so purely womanly, and I wish, a little, that they’d been let to stand on their own. Jacobs must be in on the joke–the models’ faces even resemble Helena B-C. This is just shocking, hideous, horrifying. A joke. This is, I fear, what happens to a great deal of fashion designers who pride themselves on creating zany collections. The only cohesion is the uniform, garish chaos of each individual ensemble. I have never been more disappointed nor appalled. Interesting. I like it. I like the era he’s drawing from. But this is very “through the looking glass”. The size of the hats and the shawl with gigantic stitches and gigantic pin reminds me very much of dressing up Barbie in clothes from the “craft bazaar”. Is this Will Wonka meets Louis XVI? Oh, c’est un peu ridicule, non ? Adore the look head to toe……………. Where can I buy those shoes? Those hats are soo Pamela Anderson & Tommy Lee. They wore those all the time. The hat maker is Ivy Supersonic, ivysupersonic.com The shoes are very 80′s “New Romantic” movement. Very John Fluvog from that era. Not a fan of either of these looks. HOLLY HOBBIE circa 1970s/80s!!! Reminds me of my HH books. Love it!!!! Either you love it or you hate it, evidently. I hate it, but want to be kind so I say it looks a lot Sophia Loren-like. (But without the sophistication). I am loving this collection! All of the textures put together make for a warm look! I can see where people can think that the hats are too much but I actually see it as a statement peice along with the shoes! Marc Jacob really did an amazing job!!!! I absolutely love it all! Whimsical, yet wearable, thank you Mark, you are brilliant!